ProScreener is a powerful scanning tool that identifies the securities matching your searching criteria in real-time. 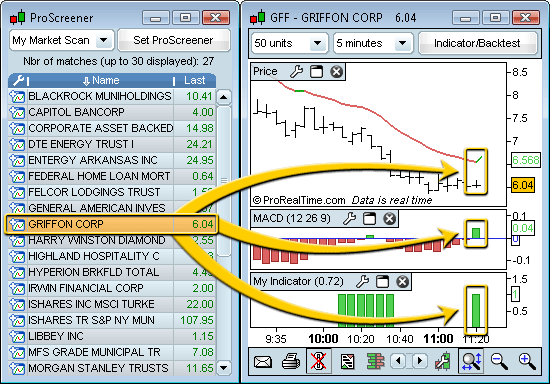 Do not spend time and effort in looking for your trading opportunities, just ask ProScreener! ProScreener performs a full market scan and presents a selection of securities matching your criteria in that precise moment. ...and with ProScreener's Wizard, create your scans without writing a single line of code. Example: The ProScreener stock screener filters 3700 stocks in the Nyse market to extract 27 stocks showing a change in direction of the Moving Average, a positive MACD and a positive value of a custom indicator. More exclusive features: automatic drawing of support and resistance lines.